Star Nations Magazine is a monthly magazine brimming with insights from our contributing writers who share their experiences and wisdom. 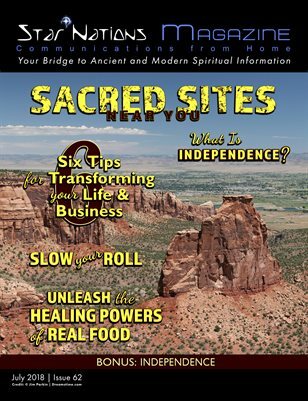 Star Nations Magazine covers many fascinating, spiritual topics. We bring together spiritual information about Indigenous people of Turtle Island and across the world. We include information about Angels, Feng Shui, chakra balancing, tarot, astrology, business, shamanism, animal communication, ascension, and Egyptian mysteries. All the articles within each magazine issue are intended to assist you to be consciously awake on your spiritual path in life. Dedicated to the world as one, universal community, Star Nations Magazine recognizes the sacred connections between All People and our relationship to Spirit. Star Nations Magazine is your bridge between Ancient and Modern spiritual information.